To avoid danger of suffocation or choking, keep this wrap away from babies and children. Avoid contact with cutting edge. Not for use in conventional or convection ovens, stovetops, toaster ovens or browning units. To prevent wrap from melting, foods high in fat (like bacon) or sugar (like pastries) should not come in contact with plastic wrap in the microwave. When microwaving, turn back one corner of Press'n Seal wrap to vent excess steam. 1. Lift: Lift edge to start roll. 2. Pull: Pull sheet up (sealing side is down). 3. Place: Place second sheet on top. Individual portions made easy! 4. 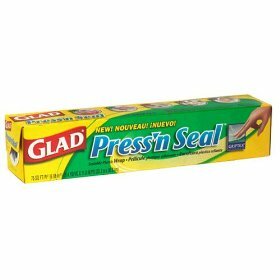 Press: Press firmly to form a tight seal. For containers, using two fingers, press the Press'n Seal sheet tightly against the dry rim. Barilla Roasted Garlic Sauce.Barilla.The Choice of Italy.Italy's #1 brand of pasta sauce.All natural.No preservatives.2 servings of veggies*Gluten free. Kraft Shredded Mild Cheddar Cheese.recloseable.Zip-Pak.Natural Cheese.Cheesemaking Since 1914.Straight Off The Block.2 Cups.Net wt 8 oz (226g). California Pizza Kitchen Sicilian Recipe Crispy Thin Crust.Italian sausage, spicy ham, salami, basil, mozzarella and fontina cheese, and zesty marinara sauce on a crispy thin crust.No artificial flavors.Preservative-free crust.Per 1/3 pizza:320 calories.7g sat fat, 35% DV.860mg sodium, 36% DV.4g sugars.18g protein, 30% DV.Calcium, 20% DV.See nutrition information for total fat, saturated fat and sodium content.U.S. inspected and passed by Department of Agriculture. Dannon Strawberry Light & Fit Greek Nonfat Yogurt.Naturally & artificially flavored.80 calories*.12 g protein*. *Per 5.3 oz.4 pack.Grade A.4 - 5.3 oz (150g) cups/1.32 lb (600g).40% fewer calories than regular lowfat yogurt. Selection was easy and arrived exactly when they said it would. Recommend it!